Do you want to measure air quality where you live? Have you thought about building your own air quality sensor, but found it too much hassle to get the materials and handle the tech? We’re proud to present the first ever plug-and-play hackAIR home sensor set! 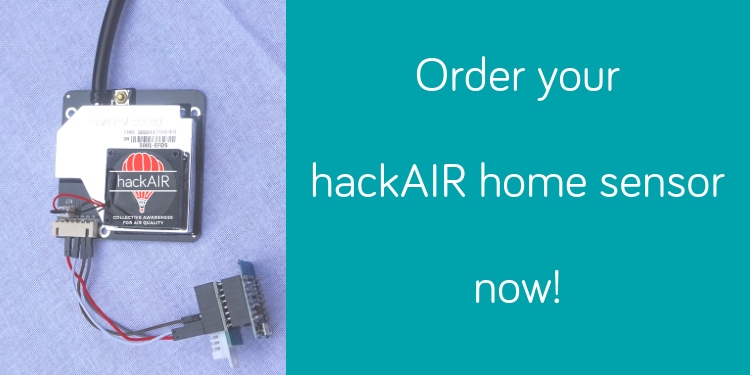 Here is our offer: order a hackAIR air quality home sensor and receive all you need, already soldered, assembled AND pre-programmed for you. No collecting separate pieces from different stores, no need to deal with customs – and: no fussing around with a soldering iron. No confusion about which wire needs to go where. And you don’t even have to download software to get started. We have a limited amount of sensor sets and expect to sell out quickly. Make sure that you get your sensor – by ordering today. The hackAIR home sensor measures particulate matter concentrations (PM10 and PM2.5) using a low-cost sensor called SDS011. Every five minutes, you will be able to see a new measurement from your location on platform.hackair.eu – and you can compare it with other measurements from your neighbourhood (including from official air quality sensors). You can also download and analyse your measurements to get a sense of how air quality changes over time. We have purchased, assembled and programmed the main components for your hackAIR sensor. What you need to do is to add a sensor case (e.g. using an empty plastic bottle) and find a good spot for it within reach of your WiFi network (and a power cable). You will also need to register your sensor on the hackAIR platform and connect it with your WiFi. You’ll be up and running in no time. You are ready to rock with this set! And: let us know how it goes. If you need support, ask us. And: we are curious to see pictures of your sensor (+ cases). Share your images on social media and tag hackAIR!